Back in the early 1970s, tax reform, which largely introduced the taxation framework we still live with, considered whether the family, including dependants living in the home, should be taxed as one unit on one tax return. Despite the fact that economic decisions—including spending and investing – are generally made as a family unit, the thinkers of the day struggled with this question. They wanted to ensure there was no “tax on marriage. ”Specifically, people with two incomes should not be taxed as if there was only one, there by bumping the whole family into one larger tax bracket. Today, not only do we have a much broader definition of a “conjugal relationship” for tax purposes, but each member of the family continues to be taxed as an individual. Everyone is entitled to a Basic Personal Amount (federally, just $11,000 in 2012) and individual incomes are subject to progressive tax rates. That is, you pay more as you earn more, yet the family unit is not bumped into one large tax bracket. That is, except when it comes to certain refundable tax credits. Net family income – the income of both spouses – does have to be taken into account for the purposes of measuring how much of these credits your family unit will receive. This includes Canada Child Tax Benefits, the GST/HST Credit and the Working Income Tax Benefit on the federal side. Most provinces offer refundablecredits too. Therefore the size of net family income needs to be managed. An RRSP will help to reduce it, but it means looking at two net income projections, not just one. Who has unused contribution room? Should a spousal RRSP be considered? Should each spouse make a contribution? How much more will be gained from the various tax credits with the RRSP deduction in place? It’s Your Money. Your Life. Year end tax planning includes a close look at individual tax savings opportunities. But, often more can be accomplished when spouses, including common law couples, review their tax savings strategies, and their access to refundable tax credits, together. Speak to your tax professional about a”what if” simulation soon. Evelyn Jacks is president of Knowledge Bureau, which offers bookkeeping and income tax preparation courses within its curriculum. 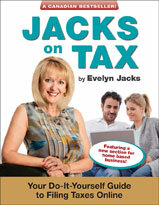 You can also offer financial education books to your clients or other family members Follow her on Twitter @evelynjacks. For more information, click here. Evelyn Jacks will be at the World Money Show, in Toronto on October 18 and 19 for book signings, a presentation on tax efficient investing in today’s economyand the launch of new Knowledge Bureau author David Christianson’s Book, Managing the Bull. Are you using your operating line of credit to buy the kids a big-screen TV? Are you also using it to fund your investment activities? Come tax-filing time, this may be a problem. The cost of borrowing to invest is a legitimate income-tax deduction. The cost of financing the purchase of a TV, however, is not. So, if you want to deduct the interest paid on your line of credit as a carrying charge, you will need to keep your borrowings separate and traceable. The onus, then, is on you to establish that the borrowed funds are being used for the purposes of earning income — from a business (this is claimed on a business statement) or from an investment in property, real or financial (claim on your Rental Property statement or on Schedule 4 – Statement of Investment Income). The Canada Revenue Agency (CRA) will want to see a direct link between your borrowing and the resulting earnings, although there are some exceptions to this rule. Remember that interest is not deductible if the loan is used to acquire a life insurance policy or property that produces tax-exempt income, or if you borrow to contribute to a registered retirement savings plan (RRSP), a registered education savings plan (RESP), a registered disability savings plan (RDSP) or a Tax-Free Savings Account (TFSA). If you borrowed to buy securities — such as common shares or mutual funds — for your non-registered account, you face another hurdle. Because common shares or mutual funds generally do not carry a stated interest or dividend payment, the interest costs on the loan may not be deductible. The CRA will generally allow you to deduct interest costs on funds borrowed to buy common shares if there is a reasonable expectation that those shares will pay dividends, whether or not they are actually do. But each case will be assessed individually upon audit. You should also know that if the source of the income for which you borrowed no longer exists or has substantially diminished because the investment has lost significant value, you will be able to continue writing off the interest on the loan as if the underlying asset still existed. It’s Your Money. Your Life. If you must be in debt, make sure the money you borrow is put to work to earn income and your interest payments are clearly traceable. That way those costs will be tax deductible. It makes those interest payments a bit easier to swallow. Evelyn Jacks is president of Knowledge Bureau, whose curriculum includes wealth-management and income tax-preparation courses. You can also offer Knowledge Bureau financial education books to your clients or family members. For more information, click here.